I am not a photographer, nor do I play one on T.V., in fact the science of photography doesn’t hold any interest for me either. However, I love photographs. I think that good photographs can capture the “soul” of a person enabling you to get to know that person even if you have never met them. I am fortunate to have many photographs of my ancestors. 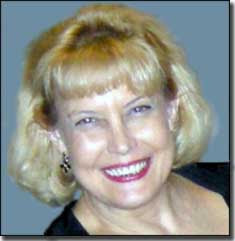 All the research I do on an individual comes to life for me when I have a photograph of that person. 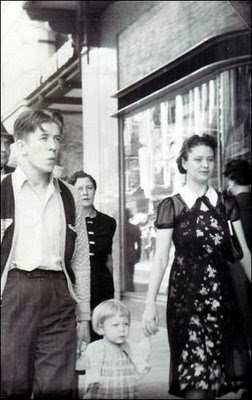 I have a photograph of my grandparents and my mother as a 2 year old child that was taken by a “Sidewalk Photographer” as they walked down the main avenue in Garnett, Kansas. They were unaware that they were being photographed and the result was a captured moment in time unlike any other. 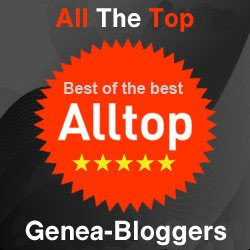 Being the Educated Genealogist that I am, I became curious about the “Sidewalk Photographers” in general and decided to look into the whole topic further. The Great Depression hit everyone hard. No one had money for the necessities in life much less for any extras such as family portraits taken in a studio. To try and stay afloat and bring in customers, some photographers got creative. If customers weren’t coming in to the studio then bringing the studio out to them might be the answer. In small Midwestern towns like Garnett, Kansas, Saturdays were the day of the week that most folks came to town. People would be strolling down the main street, unaware that their photo was about to be taken. After the cameraman snapped their photos, he would approach them and offer a coupon or business card which when presented at the studio, one could pay a nominal fee for the photo. As you might imagine, con men in large cities used the premise of sidewalk photography and ran scams. 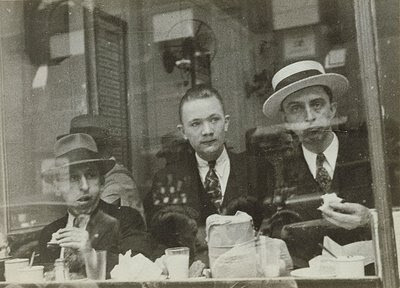 In New York City, during World War II, there were a number of unscrupulous so-called photographers that preyed on soldiers who were on furlough. They snapped the serviceman’s photo and for a price (to be paid up front) they would promise to mail the photo to a loved one back home. An investigation into these “pestilential sidewalk photographers” found that not only did they neglect to mail the photos as promised, their cameras were completely devoid of film! In St. Petersburg, Florida, they had a different kind of problem with their sidewalk photographers. Many complaints were being filed with the city manager accusing them of “funny tricks”. It seems that these “tricksters” were making it a practice of snapping photos of people as they were emerging from a well patronized package store (that’s a liquor store to us Yankees). The complaints went on further to claim that they were being subjected to a “mild form of blackmail”. Then there is the story of the woman from Chicago, Illinois who in 1944, came across a photo stub in her husband’s coat pocket. She mailed it in and one week later opened an envelope that had a photo of her husband in it . . . with another woman. This type of photography really didn’t stick to just the sidewalks. It was popular in the 1940’s and 1950’s for nightclubs to have a photographer on the premise to snap patron’s photos capturing the great time they were having and present it to them as a gift in hopes of a repeat customer. Then there is the photographer who turned sidewalk photography into an art form. 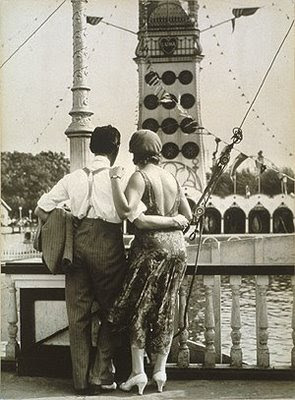 Walker Evans was simply brilliant with his camera. The photos he took of everyday people in everyday situations captured the essence of the subject. I choose three from a couple of different collections to share with you. 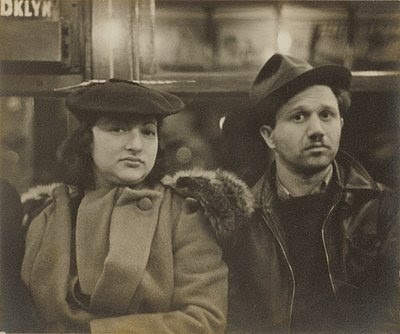 For the purposes of Walker Evans's continuing quest to obtain anonymous portraits, the subway was the place "where the people of the city range themselves at all hours under the most constant conditions." In order to remain inconspicuous, Evans used a hidden camera: a small, fast Contax that he painted flat black, strapped to his chest, and operated with a long wire strung down his right sleeve. In 1966 he published the images with James Agee's introduction as the book Many Are Called. I have noticed that these sidewalk photographers were particularly common in the 1930s and 1940s, but wonder if any readers have come across similar photographs in their own family collections from earlier decades? Your article about sidewalk photographers is having some repercussions. Have a look at the latest example that a reader's sent in. This is a great subject; I will remember to tell my kids I am part of a long tradition when they roll their eyes at my impromptu photo sessions. Thanks for the very informative article. Dear Sheri, I was inspired so I wrote a post about a street photograph I found amongst my mother-in-law's photos from Spain. Thanks, I mentioned you in the post, too.